Toon's Tunes : Get it mulched! Temperatures are going to reach the 90's farenheit this week, and no rain in the foreseeable future. I have to mulch the flower beds--the ones that I've already dug and planted, and the ones that haven't been tamed yet--either to shade roots and keep moisture in, or to keep the weeds down. 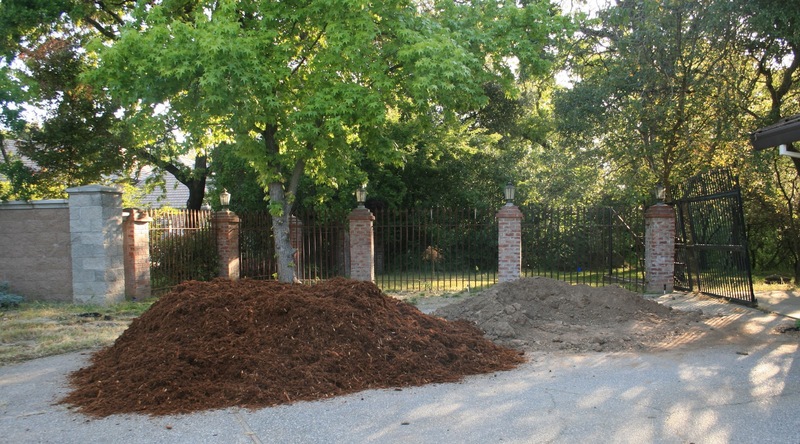 Six cubic yards of shredded cedar bark arrived on the driveway yesterday morning, causing a dog-barking cacaphony in the middle of my weekly staff meeting. It was "supposed" to arrive late afternoon, after day's phone conferences were over, and the delivery guy was "supposed" to know where to leave the mulch, without knocking on the door... but you know how that goes. I should be happy he was early, and concientious enough to check before putting it in the wrong place. This stuff will break down over the months, adding much-needed vegetable matter to the clay topsoil.